FINDING: Most groceries, though Mexican groceries frequently offer avocados ripe and in the greatest variety. 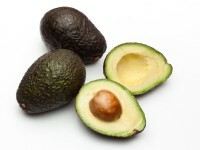 CHOOSING: The pebbly, dark-skinned Hass avocado has a very buttery texture and doesn’t discolor quickly when cut. Smooth, green-skinned Fuertes are a good option for similar reasons. Large, shiny, smooth, green-skinned Florida avocados have a much less creamy texture. Never choose avocados with soft spots, and ones that are so ripe that the pit shakes around inside. For mashing, choose avocados that give under gentle pressure; for chopping or slices, choose ones that are a little firmer.